The stock market is crashing with the S&P 500 index down 3.3% and the Nasdaq down 4% today. Both indices closed at their lows for the day and have continued lower in after-hours, which adds to the bearish view. 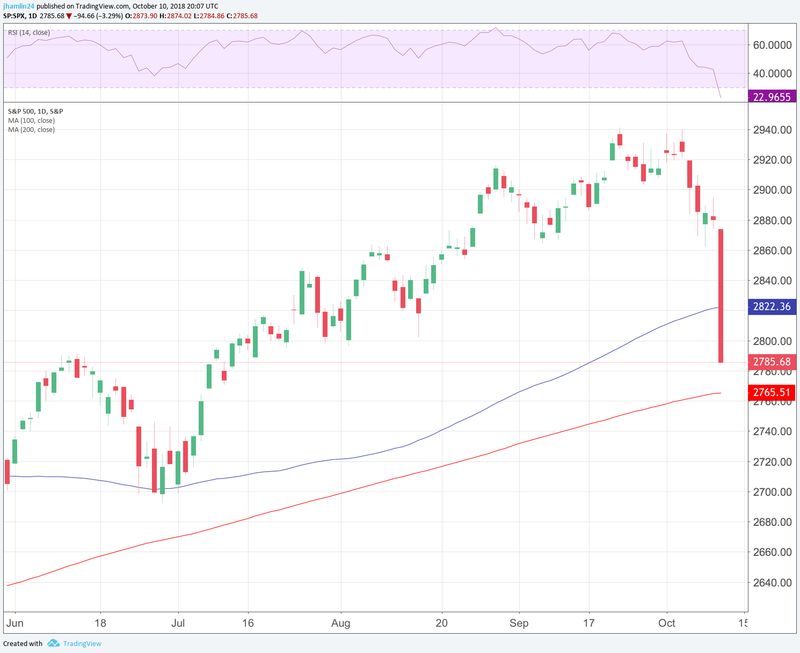 The Dow had it’s worst day since February 8th and the S&P 500 fell through support at the 100-day moving average to 2,785, which was resistance in June of this year. Prior resistance often turns into support and the RSI is oversold, so we could get a bounce over the next few days. The next major level of support for the S&P 500 index is the 200-day moving average at 2,765. 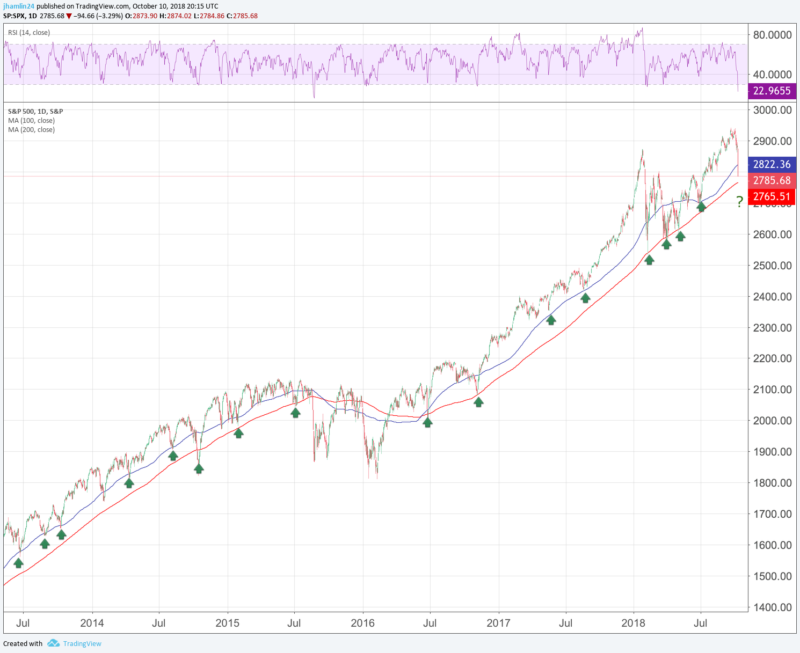 The 200-day moving average has held on almost every correction in the past 10 years, with the exception of a few instances. Likewise, the RSI has only dipped below 30 during a few instances in the past decade and typically bounced back very quickly. It is currently at 23. Will this time be different? We have been anticipating a major stock market crash for some time now and have admittedly been early in these calls. But a myriad of factors are weighing heavily on stock this week, increasing the odds that the current correction would be more than a normal pullback. The Federal Reserve has been raising interest rates and reducing their balance sheet. They are essentially taking away the punch bowl, making it more expensive to borrow money, more expensive to pay off debt and more difficult for business to grow. They have shifted from quantitative easing (QE), which helped pull the economy out of the financial crisis of 2008, to quantitative tightening (QT). In QE, a central bank buys bonds to drive down longer term rates as well. As it creates money for those purchases, it increases the supply of bank reserves in the financial system, and the hope is that lenders go on to pass that liquidity along as credit to companies and households — spurring growth. The Fed is now letting up to $50 billion of its bond holdings mature every month without replacing them. That takes money out of the financial system, as the Treasury Department then finds new buyers for its debt. The Fed describes the winding down of its balance sheet as part of a “normalization” of its policy stance, along with rate hikes, given the solid performance of the American economy and rising inflationary pressures. But the risk is that the Fed may overestimate the strength of the economy and normalize faster than the markets can handle. One slight miscalculation can lead to a full blown market crash and major Recession or Depression. 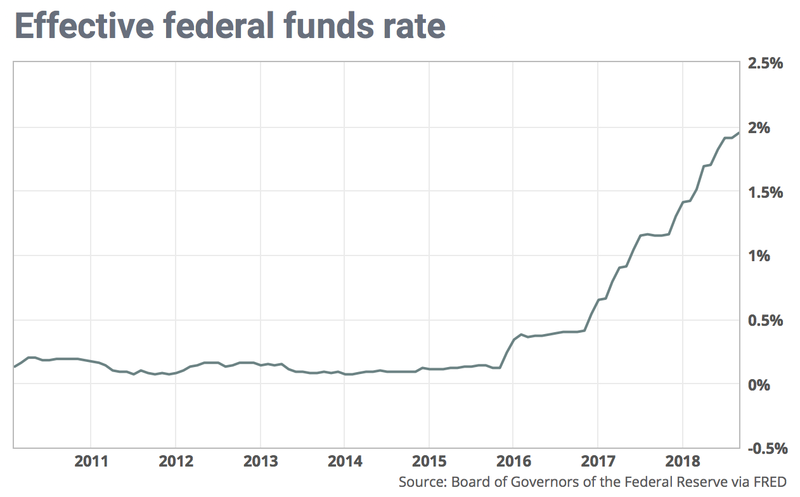 President Trump has come out today pointing fingers at the FED, saying that he doesn’t like the interest rate increases and believes they are raising rates too quickly. “I think we don’t have to go as fast,” the president answered to a question about the Fed raising rates by CNBC from the south lawn of the White House. “I don’t want to slow it down even a little bit” when there are no signs of inflation, the president added, referring to the economy. But the President’s trade policies and tariffs are cited as part of the reason for the decline in stocks. Investors are increasingly worried about a full blown trade war, not only with China, but with allies such as Canada and the EU. Trump is applying his business negotiation skills in an attempt to gain better trade terms of the United States, but there is the risk that he miscalculates his leverage or that China calls his bluff. If the trade wars accelerate, this could lead to a stock market crash and slowing economy. The U.S. government had a $214 billion budget deficit in August, nearly double that of August 2017. The federal deficit rose to $782 billion for fiscal year 2018, the largest shortfall since 2012. ZeroHedge reported that the total gross national debt in fiscal 2018 rose by $1.27 trillion to an all time record of $21.52 trillion. A massive $523 billion was spent on debt interest in fiscal 2018. As interest rates rise, the cost to service this debt increases significantly. This is essentially sapping productivity out of the economy, as more and more is spend on debt interest versus initiatives that can help spur economic growth. Eventually, higher tax rates will be required, threatening to erase all of the economic gains gleaned from President Trump’s tax cuts over the past two years. Corporate earnings for the third quarter could help stocks bounce back from this drop if they are strong. Given that corporate earnings have generally beat expectations this year, the odds of another strong quarter are high. This is leading traders to consider buying this dip with the view that it is a short-term moved induced by panic-selling on the street. While investors typically rush to cash or bonds as safe havens during stock market corrections, we aren’t seeing this happen as much this time around. The dollar index dropped today and the bond markets have been weak as well. But there are a few assets that have moved higher today and are likely to continue benefiting as they are non-correlated to traditional financial markets. First off is the well-known safe haven in gold. The gold price spiked $5 higher today, but still remains below $1,200 and is down on the year. Gold often has a delayed reaction to market crashes. 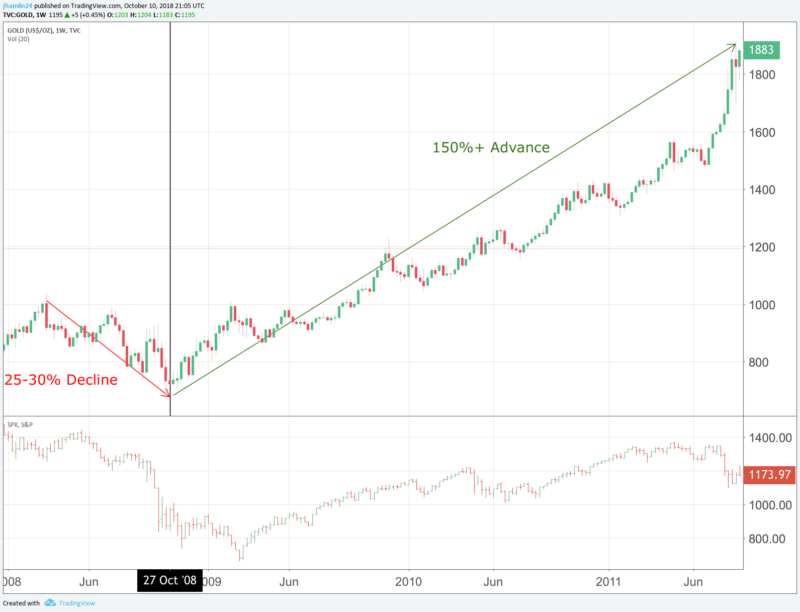 The price initially gets dragged down with everything else, but it bounces back very quickly and tends to be one of the best-performing sectors following a stock market correction. Below is the gold chart showing the price performance from 2008, into the financial crisis and in the few years following that crisis. 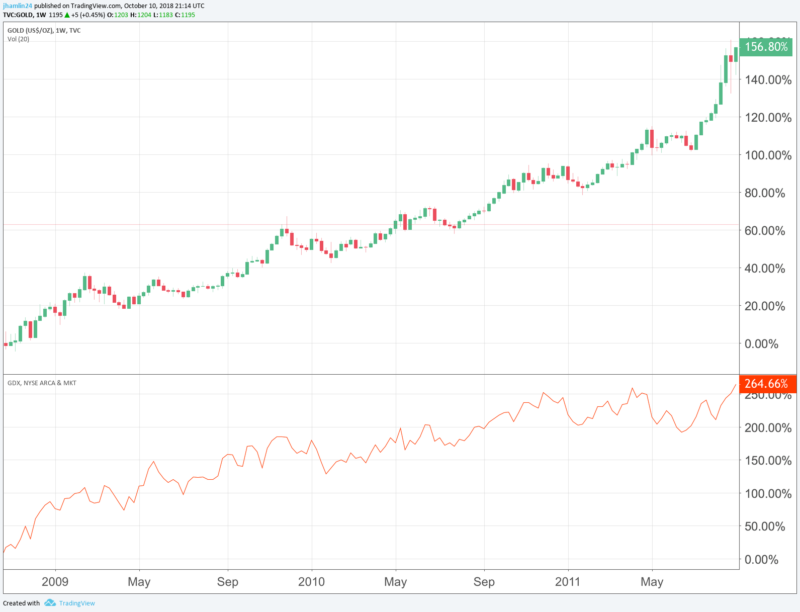 We can see that the gold price initially fell by 25 to 30% from $1,000 toward $700 leading in the early stages of the stock market correction. But, it had a turning point in late October of 2008 and started heading higher, well below stock bottoming in March of 2009. Gold starting heading higher right as the stock market crash accelerated and continued moving higher after stock bottomed and rebounded. The gold price outperformed stocks and moved up more than 150% from the low of $700 to $1,900. Thus, you want to start accumulating precious metals and mining stocks in the early stages of the correction, as they get dragged down with stocks. If history repeats, this will be a very profitable strategy, not only protecting your wealth, but increasing it significantly in a time of economic crisis. It is also worth mentioning that gold mining stocks outperformed gold by a significant margin following the 2008/09 financial crisis. While gold was up 156% from the 2008 low to the 2011 high, the Gold Miners ETF (GDX) was up 265%. Of course, the performance differential changes depending on the time period chosen, but this gives us some indication of the leveraged gains that are possible in mining stocks. Shorting some of the stocks that have reached nosebleed valuations is another way to protect your portfolio and profit during a stock market correction. This can be done with a margin account at your brokerage, using inverse ETFs or via selling calls or buying puts. We booked gains today in our short position against an overvalued pharmaceutical company, plus realized profits in cryptocurrency positions and cannabis stock positions. If you want to receive our research, real-time model portfolio, trade alerts and monthly letter, click here to get started for just $55!